You tube logo Text "you tube"
In 1950, following the War of Independence, the industry stabilized. The manufactures, who received allotments of rough diamonds from De Beers, re-organized, and the owners began to supervise their work. Senior workers and some professional managers entered the industry as managers of groups, initially working on a contract basis. They established small factories which employed a small number of workers. The main difference between the small factories and the medium to big factories was in the method of management and employee salaries. The group owners conducted both the professional and managerial work in order to cut expenses and be able to compete with the companies which received rough supply from the C.S.O (De Beers’ Central Selling Organization); thus, their operational expenses were significantly lower. In 1951, the Israeli Diamond Exchange joined the World Federation of Diamond Bourses (WFDB). In 1955, the Israeli government established diamond polishing factories in development towns. 12 polishing factories were established in the south and north of Israel. These provided a temporary solution to unemployment, since many of them were closed down. In 1956, the World Diamond Congress was held in Israel for the first time. To honor the occasion, the Israel Postal Company made a special postmark. 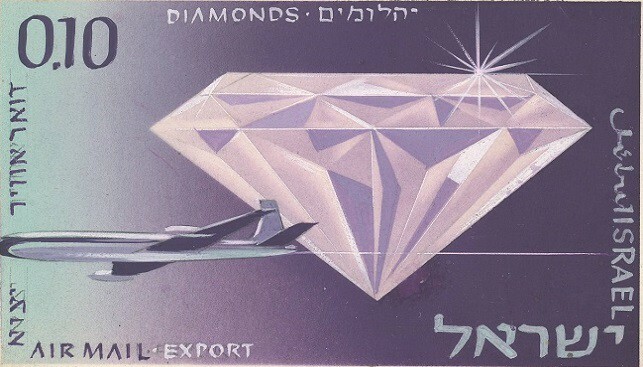 In 1957, diamond exports constituted 24.2% of total exports in Israel, and 40% of total industrial exports. The industry employed approximately 3,000 people, and the volume of exported diamonds was almost equivalent to the volume of all other exported goods combined. The Israeli government participated in talks with De Beers for rough allocations, and a special governmental branch was established for the purpose. In 1959, the first shipment of rough diamonds arrived from Africa, and De Beers resumed its rough diamonds supply.